October is Breast Cancer Awareness month! This year, Rallye has chosen to support the Maurer Foundation in their goal to help prevent breast cancer – because the best protection is prevention. 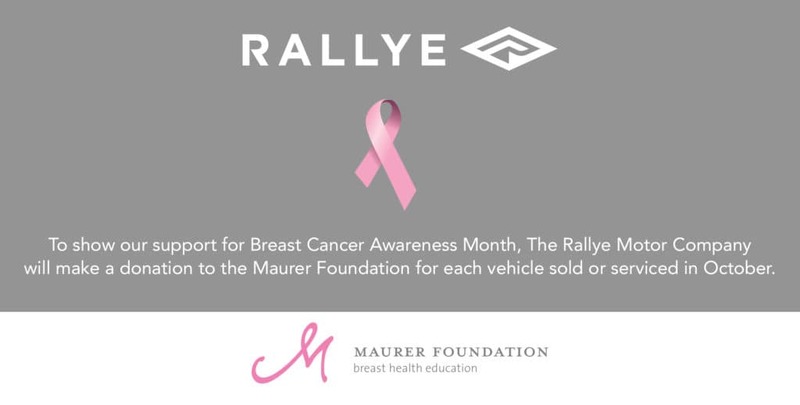 Rallye will be making a donation to the Maurer Foundation for each vehicle sold or serviced at our dealerships in the month of October. The showrooms will also be decorated with pink florals and vehicles will be dressed with pink bows. The Maurer Foundation’s mission is to promote awareness and prevention through breast health education that focuses on breast cancer prevention, healthy lifestyle choices, early detection, and risk reduction. To learn more about the Maurer Foundation, visit www.maurerfoundation.org.